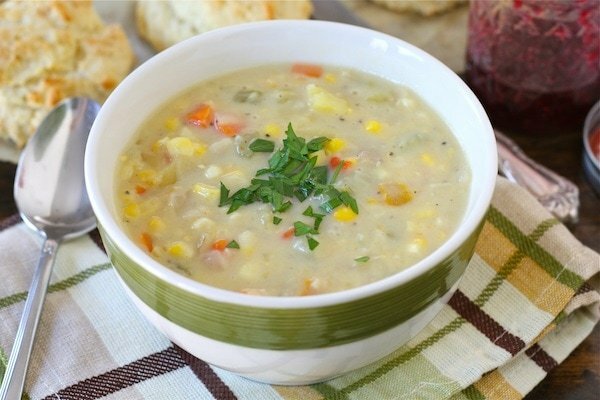 Corn Chowder – This amazing corn chowder soup is loaded with vegetables – onion, celery, carrot, red pepper, Yukon Gold potatoes, poblano pepper, and of course sweet corn. First of all, thanks to everyone for your well wishes on our new baby! If you missed the announcement, you can catch up on our little pea here. We are all doing well and are smitten by our little baby boy. Utah’s farmer’s markets are still going strong. We went to the market over the weekend and picked up a bunch of fresh produce to make a few meals. We used our fresh sweet corn to make a big pot of Corn Chowder. It is the perfect recipe to transition into fall. We were able to use fresh summer produce to make a comforting corn chowder soup. The soup was loaded with vegetables-onion, celery, carrot, red pepper, Yukon Gold potatoes, poblano pepper, and of course sweet corn. We removed the corn kernels from the fresh ears of sweet corn but didn’t discard the empty cobs. Tip: We placed the cobs in the pot with the rest of the vegetables and let the soup simmer away. The cobs added a little extra flavor! This vegetarian corn chowder is creamy, thick, and filling. We made homemade buttermilk biscuits to go with the chowder. They were the perfect addition to this comforting and delicious meal. Josh topped his bowl off with shredded cheddar cheese, which made the corn chowder even more creamy and rich. If you are looking for a hearty fall meal, give this easy corn chowder soup a try. 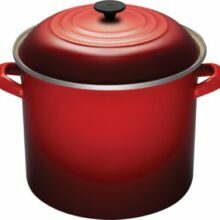 In a large soup pot, heat the butter over medium heat. Add the onion and garlic, cook for 2-3 minutes. Add the celery, carrot, red pepper, poblano pepper, and potatoes. 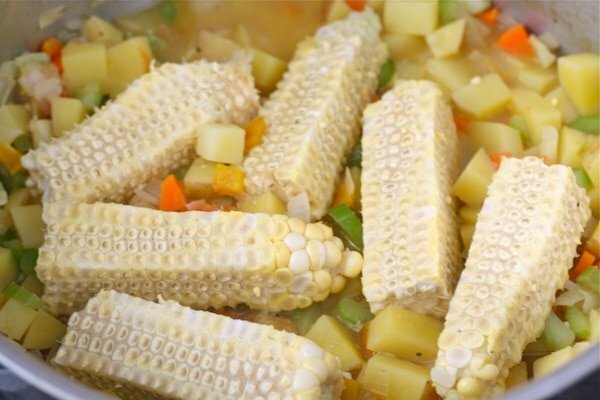 Add the vegetable broth and empty cobs of corn, if using, and cook until vegetables are tender. This will take about 10 minutes. In a medium bowl, whisk together the flour and milk. Pour mixture into the soup pot. Stir. Add in the corn kernels, thyme, salt, and pepper. Let the soup simmer for 20-30 minutes on the stove. Remove empty cobs of corn, if using, and ladle the soup into bowls. Garnish with cheddar cheese, if desired. Guess you’ve been cooking in advance – looks great, but not as cute as your new one! Oh, my! It looks delicious, and I have just added it, complete with the biscuits, to my October menu plan. This sounds lovely! I haven’t tried this kind of chowder before. Yum! Glad y’all are doing well! This looks so good. This whole no dairy thing is making me sad- I need chowder in my life!! 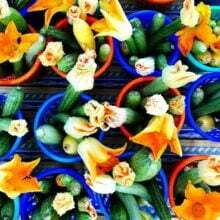 I wish our farmers markets were still going strong! I just told my mom yesterday I was craving some corn on the cob and I’m really hoping I can find a few good ears today. Love this chowder – it looks delicious. Ccongratulations on your baby boy that’s so wonderful! I hope everyone is doing well and that you had an easy delivery. I’m not sure how you managed to get this beautiful soup made but it sounds great. I like that you used skim milk vs whole or heavy cream. I look forward to trying this. Congrat’s again! just come across your blog and i love it! Corn chowder- ultimate comfort food! i can’t wait for the temps to fall here again, i’m going to be making soup every.single.night…and this is going to be soup #1! Welcome to the world, Baby Boy Pea and congratulations to the proud parents! Looking forward to trying this recipe. Some rain expected here this weekend and the chowder will be perfect! I can’t wait for temps to fall here so that I can make this chowder! YUMMY. I love the simplicity of this meal! Congratulations again! Love your name choice too! I love corn chowder! This looks like a perfect “welcome fall” recipe! I can’t wait for a nice cool, fall day to make this! This looks sooo yummy! 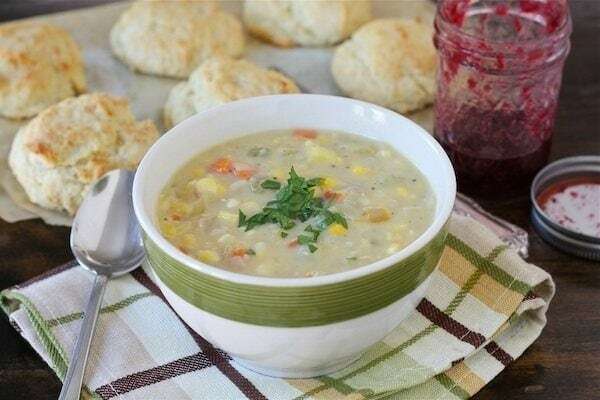 I love corn chowder…I can definitely make this in my little tiny bachelorette mini kitchen! It’s so nice to see a chowder recipe that’s not made with heavy cream! Fall has hit in the NW – can’t wait to try this! Looks so yummy! I haven’t been reading your blog long enough to notice if you respond to comments sometimes but I am wondering if this would freeze well? I know that things with potatoes sometimes don’t. Congrats again on your little guy. 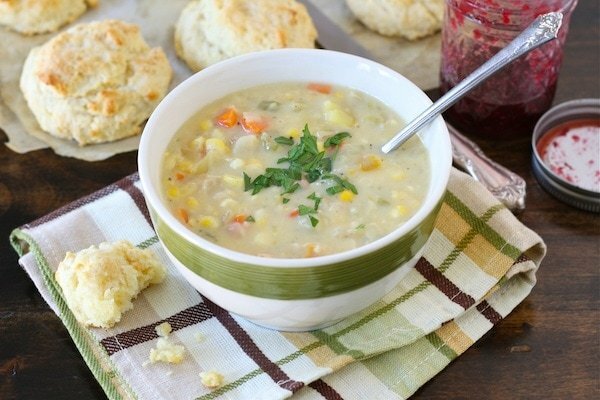 corn chowder is one of my favorite soups! Congratulations on the arrival of your adorable little man! I have to tell you that I’m impressed to see a post up here today! I love corn chowder and was planning to make some in the near future – thanks for a fantastic sounding recipe! I love this soup! It looks so tasty and comforting. Hope you’re doing well! Congratulations on the birth of Caleb! So exciting! Are you blogging from the hospital? My word! What commitment to your blog! Wow that looks so thick and creamy and to boot it’s healthy for you! Once the weather cools and I am in need of comfort food, I am making this! Thanks for the recipe! Congratulations again on your new darling boy!! 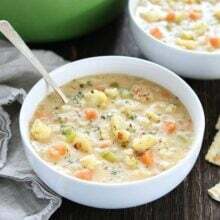 This chowder looks delicious and you are right.. the perfect way to transition from summer to fall! Making corn stock out of leftover corn cobs is definitely one of the best things I learned last year from the blogosphere. This chowder looks so good! Glad to hear you and the baby are doing well. Looks so comforting! Enjoy the new baby and the family! This sounds and looks so good. Love the idea of letting the chowder cook with the cut ears of corn too. Congratulations on your adorable little one! Do we use raw potatoes and ears of corn? What a perfect fall meal! bought corn at the farmer’s market a few weeks ago, roasted it, cut it off the cob (and scraped those cobs to nothing! ), and froze it for just such a recipe as this — thanks! Love the super low fat content! @Averie: superwoman either way — to think ahead, or to make this. I hope it was the think ahead part — rest, new mama, rest! Looks wonderful!! Congrats on your little pea he is adorable!!! Thanks for this recipe. This is a healthier version than my current one–and looks just as tasty! And, congrats on your beautiful baby boy! Bookmarked. This looks wonderful – perfect for this cooler weather. This is a perfect soup for lounging around in your jammies and…you know…snuggling with a newborn! Congratulations! A new baby AND corn chowder??? You are having a fabulous week! 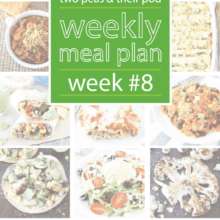 Just one question: are you changing the blog name to THREE Peas and Their Pod? Congrats to you both – he is beautiful! Awesome recipe! I made it with original soymilk and was worried the sweeter, nutty taste would ruin it but it was still great. Felt warm and nourishing on a chilly Sunday night. Thanks! Let me preface this with the fact that I have never eaten nor made corn chowder before. I am a corn fanatic though and knew I’d love it. My hubby and I teamed up to make this and it turned out just as amazing as I’d imagined. Filling yet light, sweet yet savory. Heaven. Simply heaven. 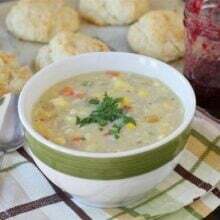 I love corn chowder and your recipe looks great. I am pinning it on Pinterest…hope mine turns out as good as yours looks! I just have to say that I love all your recipes. This soup is the first one that I made though. I’m in my last year at college and I’ve been getting so homesick (especially for my Mom’s corn chowder that she makes around this time every year). This soup was so easy! And it tastes just like my Mom’s and is just so comforting and healthy and delicious. This is fabulous! I am a blog addict for recipes but this is my first time stumbling onto yours. I didn’t have the peppers (we may not even have the poblano pepper in NS) so I put some cayenne and curry in it. I’m enjoying a bowl of it as I type. Thanks!! Glad you found our blog and glad you liked the corn chowder! I made this soup last night. It is SO yummy. I followed the instructions exactly. I recommend adding a little salt where indicated, then tasting it near the end to see if it needs more. Mine did. Now to make biscuits to go with it… Thank for the recipe! Made the soup and it’s delish!!! Thanks so much. Just one thing… it looks like you leave the ‘cob’ in the soup for flavour not the ‘ears’. The ears are what you take off the corn before you eat it (you know the things that look like rabbit ears that you throw away). I’m a stickler for detail. Thanks again. I’ll be back for more recipes. Made this last night and loved it! I make your recipes all the time and they are always perfect. I am also a vegetarian, and I love how you cook food that happens to be veg., rather than cooking vegetarian food, if you know what I mean. That is how I cook as well. Anyway, thanks for keeping my family eating well! I check your blog every week before I go to the grocery store, it is wonderful! Love this soup! Have made it for company twice and they loved it too. The only changes I made were to use olive oil instead of butter for sauteeing the veggies, and since I could not find the poblano peppers, I served shredded pepper jack cheese to sprinkle on top for a spicy accent. I did increase the amount of potatoes, just because I like them. A very hearty and delicious main dish soup! I found this recipe when I searched for good vegetarian crock pot recipes. This is number one on one of the lists, but the directions do not mention a crock pot. I realize you have cooked this in a crock pot, but as I like to follow a recipe can you provide me with the crock pot version. Thanks! Just made this tonight for my boyfriend and I. We both loved it! I used half the thyme because I had never cooked with it before and it was perfect! We will be making this again. Thanks for the recipe! made this tonight, simple to put together and delicious : ) my three children gobbled it right up! perfect end to a very chilly New England day. Yay! Glad they all liked it! Does this freeze well? It sounds super yummy! i made this annd it was amaziing! I’m making this right now, with a little bit of bacon as well. I sauteed the onion and garlic in the bacon grease instead of butter, and added the chopped cooked bacon later with the other veggies. I can’t believe how good my kitchen smells. Thanks so much for the recipe!! Congrats on the baby boy!! This looks so yummy! can this be frozen? The poblanos aren’t that spicy, but if you are afraid, you can leave them out! The potatoes give the chowder texture, but if you aren’t a fan you can leave them out. The chowder won’t be as hearty though. Thanks for the great recipe! I’m making it right now! Made this tonight. Hearty and yummy. Too strong on the thyme though for me. Next time, I’ll add only a 1/4 tsp or consider a different spice altogether. I like thyme, but not sure if I like it with corn chowder. Any suggestions on alternate spice to try? I made this tonight, but mine turned out runny. I followed the instructions exactly. Any idea on what I could have done wrong? The taste was great though! My husband said he would eat it again the way it was. I’d like to make it again to see if turns out thicker. If anyone is looking for a dairy free version, I just made this and substituted a teaspoon of olive oil for the butter, and unsweetened almond milk for the skim milk. It turned out delicious! I have made this soup 4 times since Ohio corn peaked this summer! I always plan on freezing the leftovers, but there NEVER ARE ANY! Thanks so much! PS Still rocking this soup! This looks like a great recipe! I have a question though – when you ask for ‘red pepper’ do you mean a cayenne pepper or a red bell pepper? Just wondering because it makes a big difference! This corn chowder is outstanding! I made it today and my family and I loved it. Thanks for sharing! looks so yummy! I can’t wait to try it out tonight! How long will this corn chowder last in the refrigerator?